American actress, comedienne, singer, and writer; best known for her long-running TV variety show on CBS, The Carol Burnett Show. From her signature Tarzan yell and left ear pinch what comes to mind whenever I think of Carol Burnett is her amazing accomplishments and presence in the industry. She has achieved so much success on stage, television -- a dozen years of CBS' "The Carol Burnett Show" -- and film in varying genres including dramatic and comedy roles. Happy birthday Carol Burnett! Born, Carol Creighton on April 26th, 1933, in San Antonio, Texas, Burnett was the daughter of Ina Louise (née Creighton), a publicity writer for movie studios, and Joseph Thomas Burnett, a movie theater manager. Their marriage ended in divorce in 1984, and Hamilton died of cancer in 1991. On November 24, 2001, Burnett married Brian Miller (principal drummer in and contractor of the Hollywood Bowl Orchestra), who is 23 years her junior. In January 2002, Burnett's daughter Carrie died of lung and brain cancer at the age of 38. She had become addicted to drugs as a teenager. Burnett and Carrie wrote a play together called Hollywood Arms, which was adapted from Burnett's bestselling memoir, One More Time. The Broadway production featured Linda Lavin as the Burnett character's beloved grandmother, Sara Niemietz and Donna Lynne Champlin shared the role of Helen (Carol Burnett), and Michele Pawk played the role of the mother, Louise. For her performance, Pawk received the 2003 Tony Award for Best Performance by a Featured Actress in a Play. Burnett's daughter Erin became a singer. 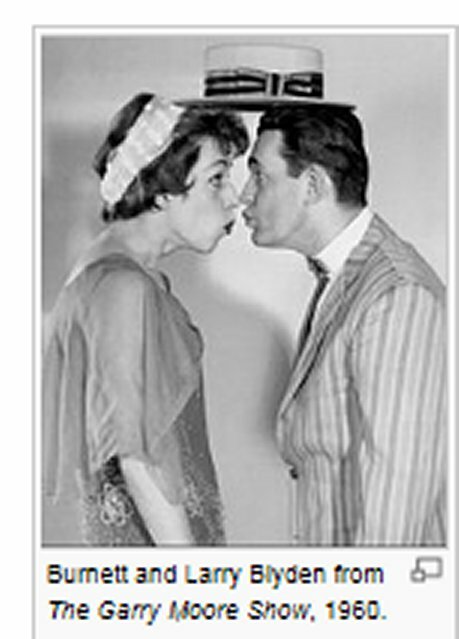 Since the 1960s, Burnett has been best friends with Julie Andrews. Burnett is the godmother of Julie's first child Emma Walton Hamilton. Will Google celebrate Carol Burnett’s 80th Birthday? ♦Star on the Hollywood Walk of Fame at 6439 Hollywood Blvd. in front of the Hollywood Pacific Theatre (below), where she was once fired from a job as an usherette. At the time, it was known as the Warner Hollywood Theatre. ♦ Burnett received a Peabody Award in 1962. ♦ She was awarded the Women in Film Crystal Award in 1980. ♦ In 1997, she was awarded the Women in Film Lucy Award in recognition of her excellence and innovation in her creative works that have enhanced the perception of women through the medium of television. ♦ She was a recipient of the 2003 Kennedy Center Honors. ♦ President George W. Bush awarded Burnett the Presidential Medal of Freedom on November 9, 2005. ♦ She was named the Grand Marshal of the 109th Rose Parade and the 84th Rose Bowl Game on New Year's Day in 1998. ♦ On December 1, 2009, she was inducted into the California Hall of Fame at The California Museum for History, Women and the Arts. 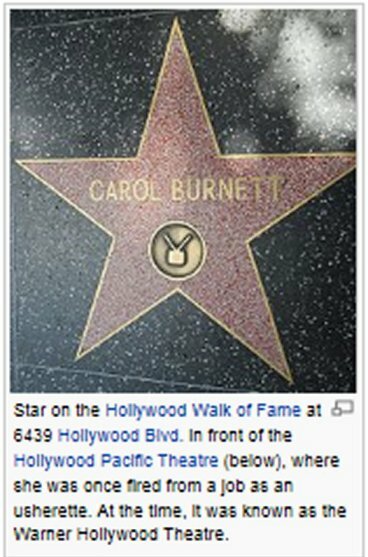 ♦ Burnett was presented a star on the Hollywood Walk of Fame located at 6439 Hollywood Blvd., in front of the Hollywood Pacific Theatre where she worked, as an usher in 1957. ♦ Get Smart (1967) as "Ozark" Annie Jones in Season 3 episode "One of Our Olives Is Missing"